Back in early September, I wrote of how we had worked to optimize in three different areas of the turfgrass operation-practice area, bunkers and putting surfaces. If you recall, I mentioned the putting surfaces were being managed differently in 2017, one of the main goals being a larger impact on our populations of the dreaded Poa annua. As I thought about writing this piece, I spent a few minute wondering what percentages of my time I spend thinking about Poa. I came to conclude that putting a metric on such time is impossible, but I can tell you, it’s a lot of time. Considering what a small percentage of our surfaces contain Poa, you begin to understand the weight I’ve placed on minimizing its impact on our surfaces. I’ve always held the belief that as Poa and bentgrass are diametrically opposed in many of their physiological needs, one can manage for one over the other by tuning their practices to the needs of the desired species. Over the course of 11 years, my belief has proven to be true; at least in the environments in which I have practiced. On the left, you see a photo from last September in which the Poa is under serious distress. As I’ve walked the putting surfaces this spring, I believe this philosophy of exploitation has proven itself once again. It appears the winter has been lethal to Poa all but a couple of isolated areas of putting surface. This without any condition this winter in which I would have expected to be lethal to Poa. My suspicion is that as time has gone on, our bentgrass favoring practices have left our putting surfaces and rootzone optimized for the management of bentgrass, while becoming less and less hospitable to Poa. 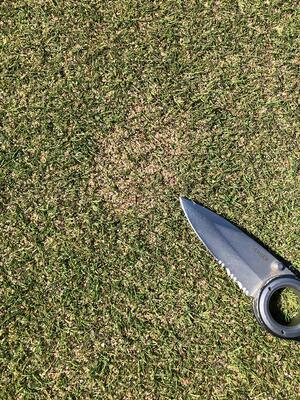 The change in practice last season left the Poa in a weakened state heading into winter. When temps in the early winter dropped well below zero, I suspect it all became too much to bear and the Poa simply gave up. The photo below shows a similar spot this spring. Poa=dead! 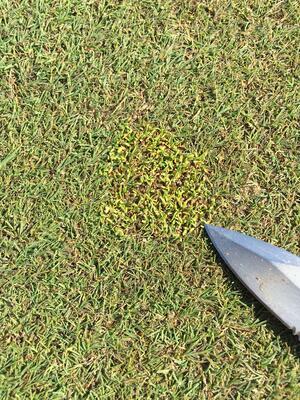 Another belief I have long held, is its easier to keep Poa out than it is to get Poa out. What does this mean for our putting surfaces going forward? If the Poa truly is gone, or mostly gone, then I suspect I’ll be able to spend more time thinking about bentgrass and less time thinking about Poa. In short, further optimization of our putting surfaces. Work to complete the drainage on five and the repair of the pond bank on 13 will begin as soon as sod is available. Probably next week. Last week I wrote of an experimental look at our 150 stakes. The question was-do our members rely on the red, white and blue colors on the 150 stakes? The answer? Yes, they do. The colored stakes have been replaced and their use will continue indefinitely. A reminder-golf course aerification will take place next week. Greens will be deep-tined and DryJected. Tees will be solid-tined and topdressed. Fairways do to the late spring and last fall’s aeration still being visible will not be aerified. Fairways 5, 6 and 7 will be topdressed as they were not able to be completed before the winter. All work will be minimally disruptive, and the golf course will be in great condition within a few days.